Play + Learn At Camp! Launch Math + Science Centers offer exciting and educational one-week STEM summer camps for kids from Kindergarten to 7th grade (ages 5 to 12 years old). With an unparalleled 4:1 camper-to-instructor ratio, children at Launch’s exciting specialty summer camps tinker with electronics, explore forensic biology, create digital media, program autonomous robots – and that is just the very beginning! Campers get to keep most of their projects so that the fun continues at home! I Wanna Be… An Astronaut! I Wanna Be… An Engineer! I Wanna Be… A Game Maker! I Wanna Be… A Physicist! Launch camp days are packed with engaging STEM activities that provide the fuel for our curious campers. Small groups (< 12 campers) and an unparalleled 4:1 camper-to-instructor ratio provide an intimate setting that enables our kids to get the most out of every camp day. Interested In Applying For A Launch Scholarship? Visit Our Summer Camp Scholarship Page! Q: When does camp start and end? A: The camp day starts at 9:00 am each day; it is recommended that children arrive between 8:45 am and 8:55 am but they may be dropped off as early as 8:30 am. K+1st camps end at 1:15 pm with the option to add Math Mania! from 1:15 pm to 3:30 pm. For those campers who need to extend the day beyond 3:30 pm check out the late pick-up option to stay as late as 5:00 pm. A: The camp day start at 9:00 am each day; it is recommended that children arrive between 8:45 am and 8:55 am but they may be dropped off as early as 8:30 am. Camp ends at 3:30 pm. For those campers who need to extend the day beyond 3:30 pm check out the late pick-up option to stay as late as 5:00 pm. Q: Where does camp take place? Please note that not all age groups are offered at all locations. Be sure to check your registration details during check out. Q: Do you offer early drop-off? A: Yes, early drop-off is available at no additional cost. With this option campers are allowed to arrive as early as 8:30 am. Q: Do you offer late pick-up? A: Late pick-up until 5:00 pm is available at an additional cost. For those campers who elect the late pick-up option, it’s all fun and games! From challenging board and card games to engaging math puzzles, campers enjoy fun group activities that keep the excitement of the day rolling along! The program starts shortly after camp ends at 3:30 pm and continues until 5:00 pm. Kids may be picked-up at any time after 3:30 pm. The fee for late pick-up is $50 for the week. Q: What is the Math Mania! program for K+1st grade campers? A: The Math Mania! program offers age-appropriate thematic curriculum woven into engaging mathematics-based projects and activities. Using themes such as Carnival Games and Safari Adventures, campers explore topics ranging from money and measurement to data collection and probability – all with a big blast of fun! Math Mania! is an optional offering for K+1st grade campers only. Add this offering to your registration at checkout. Q: My child has a friend attending camp the same week. Will they be in the same group? A: Generally if your child and their friend are attending camp at the same location and are in the same program (grade group), they will be in the same camp group. However, if you have a special request regarding the pairing of kids you must email us at info@launchmath.com as soon as possible after registration and we will do our best to accommodate (please note that submitting a request does not guarantee a child’s placement). Q: Do you offer busing? A: Unfortunately, we do not offer transportation services to/from camp at this time. Q: Can my child participate in the same camp twice? A: We offer four different camp themes that repeat throughout the summer for each of the three age groupings: K+1st, 2nd-4th and 5th-7th grades. Children may participate in all four of our camps in any order, however enrolling in the same camp theme more than once is not recommended (projects will be repeated). Q: Which camp group is most appropriate for my child? A: Your child’s placement is determined by the grade which they will be entering in the fall of 2019. EXAMPLE: If your child is currently in 4th grade and will be entering 5th grade next fall they should join one of our 5th-7th grade camps. We understand in some cases private and public school calendars may differ. If you are unsure of which group your child should join please contact Launch (info@launchmath.com) for help determining the proper placement before registering. Q: How old does my child need to be to attend camp? A: Children who want to join us for our summer camps must have turned 4 years old no later than 12/31/18 (in other words, turning 5 years old in 2019). If you have questions or concerns, please contact Launch (info@launchmath.com) for help determining your child’s eligibility before registering. Q: What is the Instructor to camper ratio? A: There are at most four campers per Launch Instructor. Q: What happens in a typical day at Camp? A: Launch packs the camp day full of STEM-based projects and challenges to keep our campers actively engaged. Campers should come with lunch, a water bottle, snack, and sneakers. K+1st campers will not be going outside during the camp day. K+1st camps end at 1:15 pm but you can extend the fun with our Math Mania! add on. For additional information please refer to the Sample Daily Schedule found on the Summer Camps page on the website. A: Launch packs the camp day full of STEM-based projects and challenges to keep our campers actively engaged. We break for lunch and each day we take the kids out to stretch their legs and clear their heads with a little fresh air. Campers should come with lunch, a water bottle, snack, sneakers, and sunscreen pre-applied. 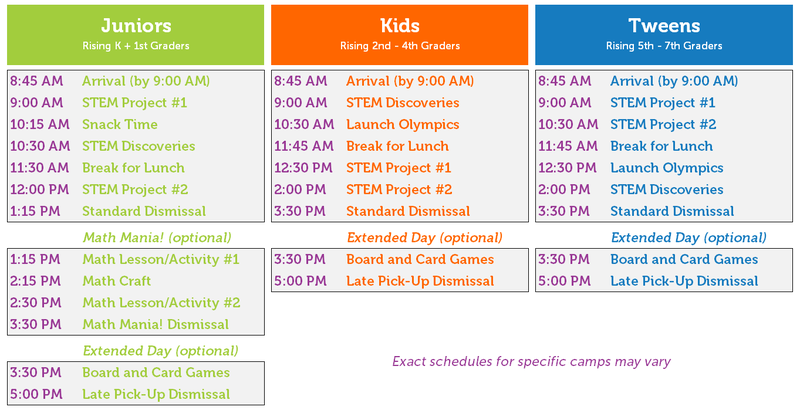 For additional information please refer to the Sample Daily Schedule found on the Summer Camps page on the website. Q: What happens during STEM Discoveries? A: STEM Discoveries engages campers in challenge-based learning through independent and/or group problem-solving activities. Kids explore a variety of STEM topics and related activities that require creativity and critical thinking skills. Projects range from physical builds using common, everyday materials to mental puzzles that involve collaborative, problem-solving methods. Q: Is there a snack time? A: Yes, approximately halfway through the morning activities there is a break for snack time. There is also a break for snack during the Math Mania! add-on program. Snacks are not provided by Launch. We recommend that children bring two snacks if they are attending the Math Mania! program. Snacks will be kept cool, if necessary. Please note we ask that parents provide nut-free snacks. A: Campers will have the opportunity to break for snack if needed. Snacks are not provided by Launch. Snacks will be kept cool, if necessary. Please note we ask that parents provide nut-free snacks. Q: What should I consider when packing lunch for my child? A: We recommend sending your child’s lunch in an insulated lunch box (if necessary we can keep a lunch chilled). However, we cannot warm or reheat lunches. All campers should be sent to camp with a large water bottle in addition to any drinks included for lunch. Please note we ask that parents provide nut-free lunches. Your child can no longer make it to camp on the week that you purchased? Launch allows campers one opportunity to switch camp weeks up to 30 days prior to the start of a session (subject to availability). Within 30 days of the start of a session there is a $50 per camp fee to switch. Your child can no longer make it to camp at all this summer? Launch allows a transfer of camp fees to a sibling or family member or friend. A $200 per camp non-refundable deposit is required to register. Canceling up to 30 days prior to the start of a session is allowed (but deposits are non-refundable). The full price of camp is non-refundable for cancellations within 30 days of the start of the session. All requests to switch/transfer/cancel camps must be sent via email to cancel@launchmath.com. Please include your name, your child’s name, the camps affected and your reason for the change. Q: Do you offer discounts or scholarships? A: Yes! We offer substantial discounts including Early Bird and Multiple Camp (Multiple Camp provides a discount for siblings and all other multi-camp purchases). Please reference our pricing and discount charts on the Summer Camps page on the website. We also offer partial need-based scholarships to offset the cost of camp. The scholarship application is available by following the link below the pricing section on the Summer Camps page on this website. Q: How do I get in touch with my child or a Launch instructor in the case of an emergency? A: In the event of an emergency only, campers can be reached at the appropriate phone number for each camp location. Location phone numbers are provided in the welcome email that is distributed each week prior to camp. If you are unable to reach a Launch representative at any particular location, please call the Launch flagship center on 81st Street at 212-600-1010 and we will contact the staff for you. For non-emergency needs, please call the Launch flagship center number first.